This product is new to Duration Windows. Therefore, there will be more information and pictures to follow shortly. For more information contact our sales dept. Face fix frames are pre-drilled as standard, reveal fix frames are only pre-drilled upon request. 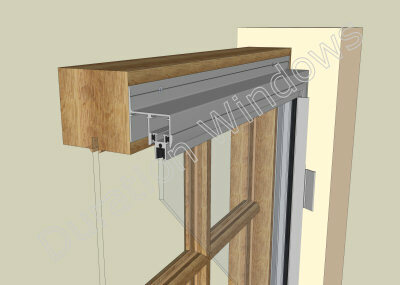 A slim-line all aluminium system that can be face fixed or reveal fixed and is easy to install. Supplied with cover trims in a selection of shapes and sizes for concealing the subframe and fixing screws. Variety of glass types available to tailor our secondary glazing to your individual requirements; be it heat, noise or security that is your priority. Highly suited for domestic applications due to its clean finish and concealed fixings. Optional foam insert can be pre-applied to the outerframe, which will further increase the insulation & acoustic performance. If the style of secondary glazing that you require is not available in this system please see our Economy Odd Leg system, Luxury Subframe system and Heavy Duty system.